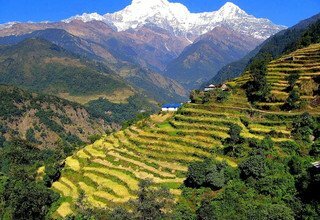 Ghandruk Loop Trek for families is one of the popular trekking trails in the Annapurna region that offers an introduction to Nepal with splendid scenery, enticing Gurung culture, and stunning views of mountains. It is one of the easiest treks in Nepal and can be done by a person of any age with sound health, making it a family friendly trek. 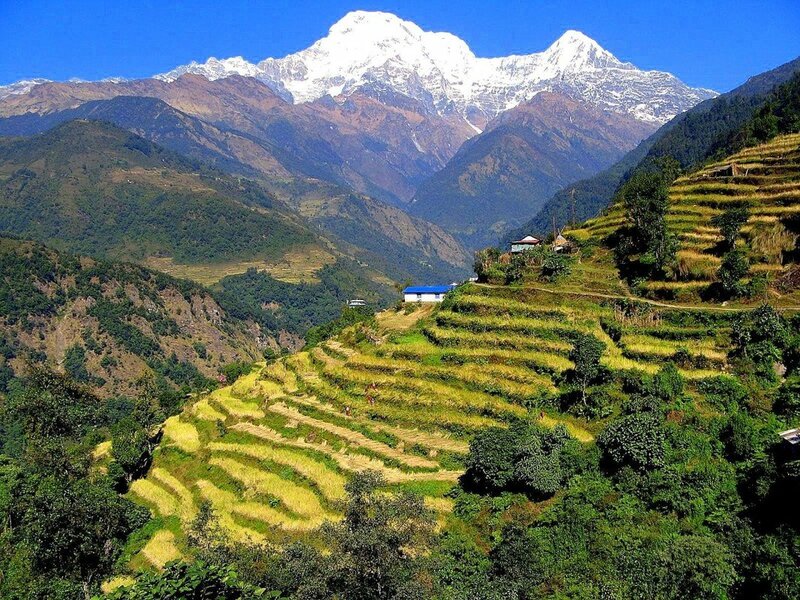 The 9 days Ghandruk Loop Trek for families starts with your arrival in Tribhuvan International Airport, Kathmandu, and a visit to some of the UNESCO enlisted world heritage sites in the valley like Swayambhunath, Boudhanath Stupa, and Pashupatinath Temple. Leaving behind the valley, the trip continues with a scenic flight to the lake city, Pokhara, followed by a short drive to Kimche via Nayapul. 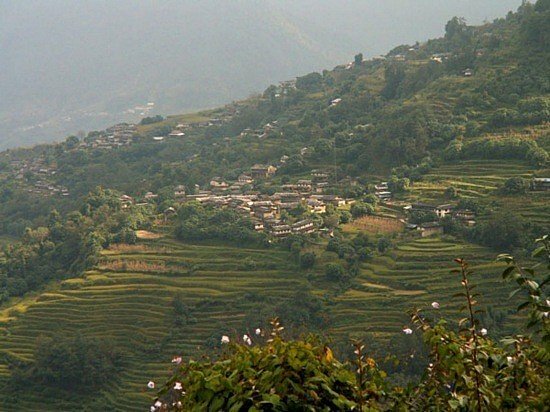 The trekking journey begins in Kimche to reach the wonderful village of Ghandruk, which is the largest Gurung village in the Annapurna region. The trail follows flag-stone steps that go through densely forested paths filled with rhododendrons, oak and pine trees. 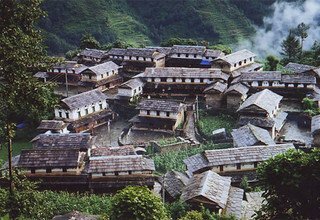 The Ghandruk Loop Trek passes through several traditional villages like Chomrong, Landruk, and Dhampus inhabited mostly by the Gurung community. 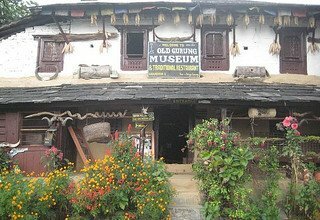 This trek provides you and the whole family an opportunity to learn and understand the rich culture and tradition of the Gurung people living in this area. 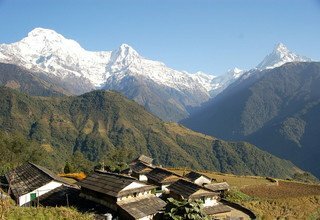 Not only this trek entices you with rich culture, it also offers a spectacular view of snowy mountains such as Annapurna South (7219m), Machhapuchhre (6993m), Hiunchuli (6441m), and many other peaks. 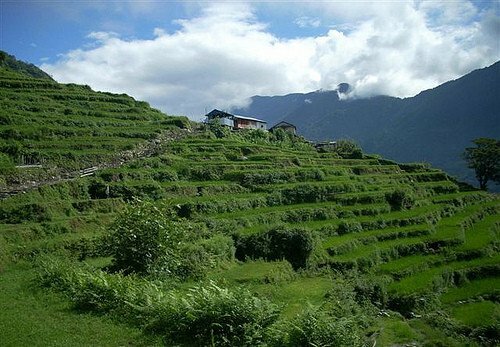 Ghandruk Loop Trek with families is an ideal trek for people who want to experience trekking in Nepal in a short time period while being accompanied by the whole family. Dominating the tourism industry for more than 15 years, Swiss Family Treks and Expedition is a well reputed and trusted organization. 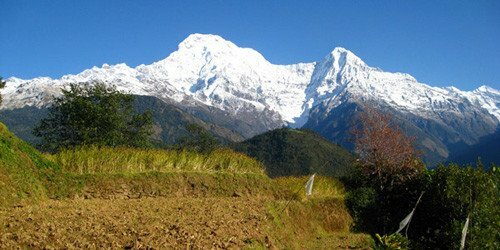 We are the pioneers of family treks in Nepal hence our focus is always on making trekking in Nepal safe and comfortable for you and your family. We provide you with a highly experienced and knowledgeable guide to help you make the best out of your family holiday. In the case of children below 5 years of age, we can assign you a porter to carry the child. Upon your arrival at Tribhuvan International Airport, Kathmandu, our staff member will pick you up and transfer you to the hotel. Overnight at a 3-star hotel in Kathmandu. Today our guide takes you around Kathmandu valley to visit some of the UNESCO enlisted world heritage sites that includes Boudhanath Stupa (largest stupa in Asia), Swayambhunath (Monkey Temple), and Pashupatinath (sacred temple dedicated to Lord Shiva). Overnight in hotel. 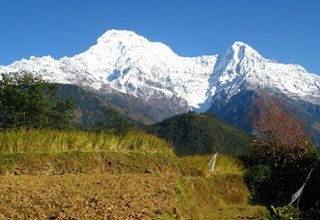 Day 3: Kathmandu to Pokhara 820m by flight and drive from Pokhara to Kimche via Nayapul and trek to Ghandruk 1940m (2/3 hours). 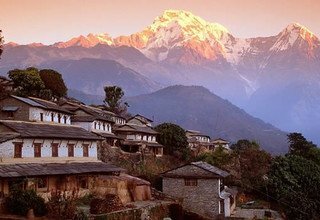 We fly to Pokhara early in the morning relishing an amazing view of majestic mountains from Ganesh Himal to Annapurna, Manaslu, and Langtang ranges. 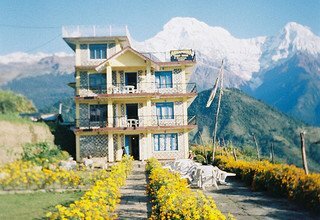 We take a short drive to Kimche from Pokhara via Nayapul. 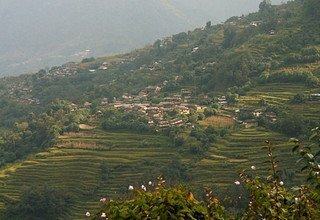 From Kimche, we start to trek towards Ghandruk, which is the largest Gurung village in the Annapurna region. We ascend towards Ghandruk walking on stone steps, enjoying the beautiful landscape in the background. 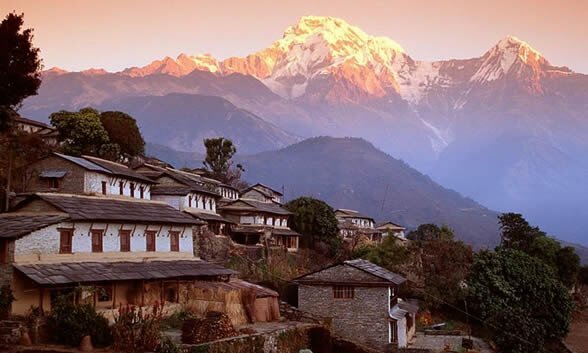 Ghandruk offers a great view of Annapurna South (7219m) and Machhapuchhre Himal (6993m). Overnight at lodge. 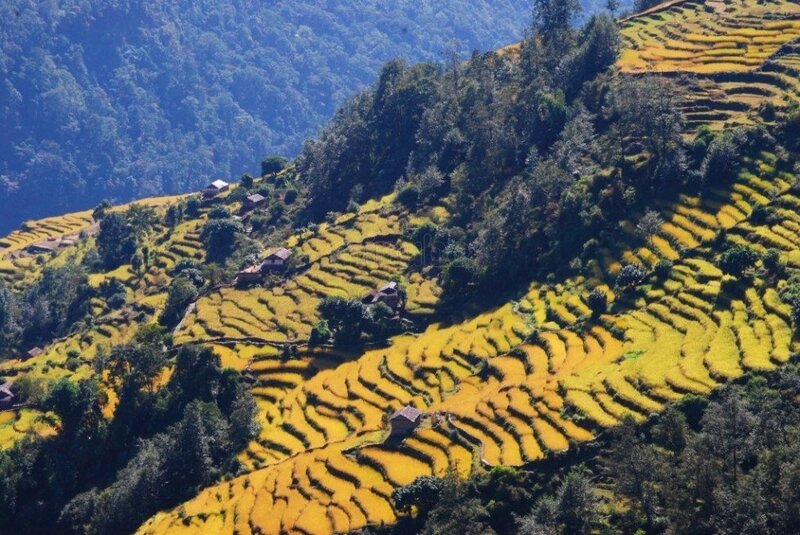 Day 4: Trek from Ghandruk to Chomrong 2170m (4/5 hours). Leaving Ghandruk behind, today we trek towards Chomrong passing through several villages and small streams. We then ascend through a stone staircase that leads us to Kimrung Danda, which offers an up-close view of Annapurna South (7219m), Machhapuchhre (6993m), and Hiunchuli (6441m). 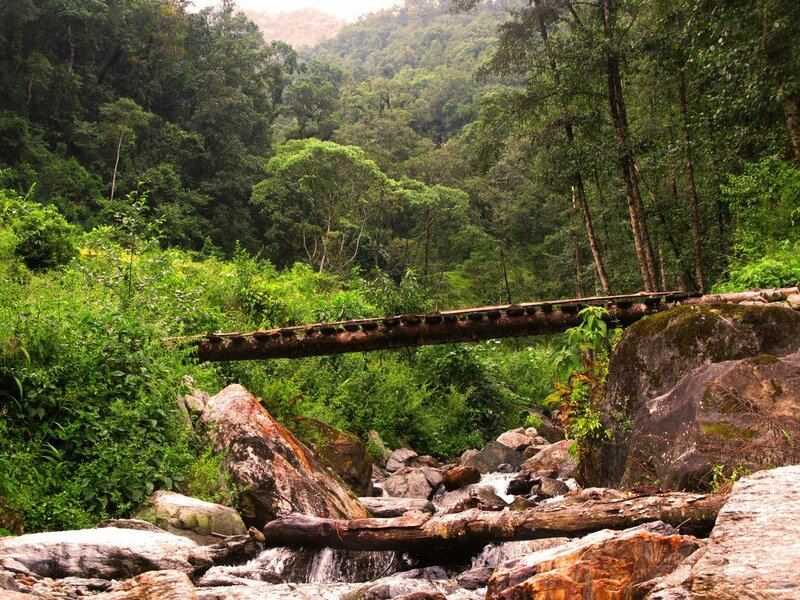 From there, we descend to Kimrung Khola through a forested path filled with oak and fir trees. After crossing the suspension bridge, we make a steep climb up to the ridge to finally reach Chomrong. Overnight at lodge. Day 5: Trek from Chhomrong to Landruk 1565m (5/6 hours). 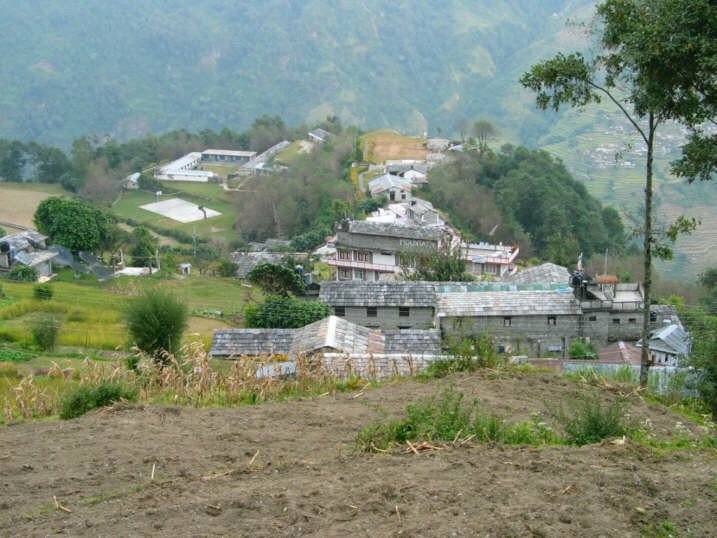 Today the trail descends steeply to Jhinu Danda, which is known for its natural hot spring. We continue to descend steeply to the small stream and walk through the bushes of nettle till we reach New Bridge. 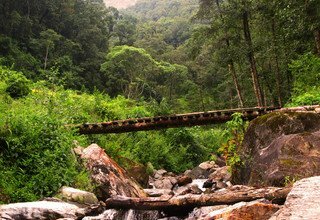 We cross the bridge over Modi Khola and continue to walk alongside the river. 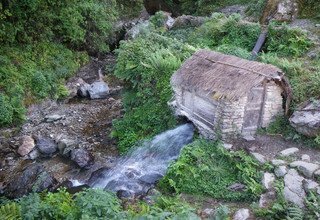 We also come across several small waterfalls, hanging beehives in the rock walls, and hanging bridge on our way to Landruk village. The picturesque Gurung village serves an amazing view of Machhapuchhre (6993m) and Hiunchuli (6441m). Overnight at lodge. Day 6: Trek from Landruk to Dhampus 1650m (5/6 hours). 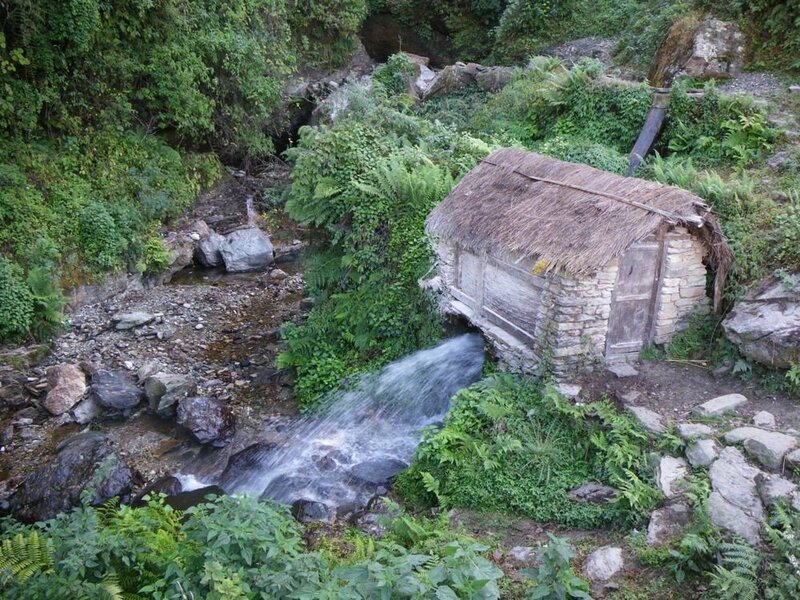 Today we head towards Dhampus village slowly climbing up until we reach Tolka. 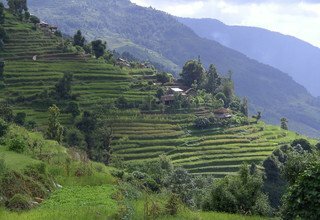 We continue to ascend on a steep slope for a while and later follow the zigzag trail through the forest towards Deurali. We pass through Pothana then descend gently on the stone steps until we reach the village of Dhampus which offers amazing sunset and sunrise over the mountains. Overnight at lodge. 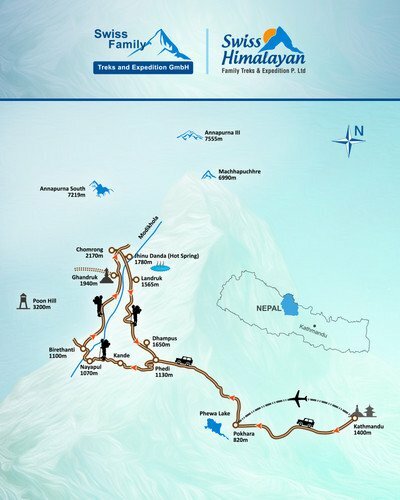 Day 7: Trek from Dhampus to Phedi and drive back to Pokhara 820m (2/3 hours). 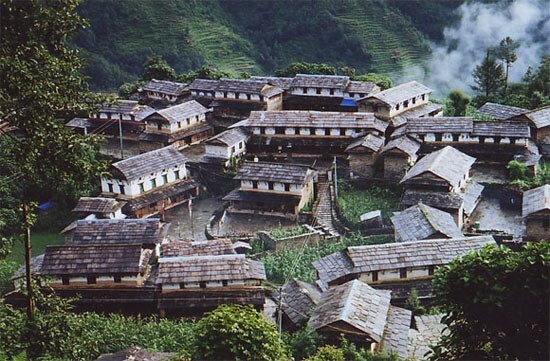 Leaving the beautiful Dhampus village behind, we head towards Phedi descending on the stone staircase through the forest filled with oaks, rhododendrons, and pines. Accompanied by the stunning mountains in the background, we make our way to Phedi. From Phedi, we take a drive back to Pokhara on the private jeep. In the afternoon, we go for a boat ride in Phewa Lake. Overnight at hotel. Day 8: Fly from Pokhara to Kathmandu. We catch our morning flight back to Kathmandu with amazing views of the Annapurna, Lamjung, Manaslu, Langtang and Ganesh Himal ranges throughout the flight. We transfer you back to the hotel in Kathmandu. You can spend the day resting and relaxing or strolling around the markets to buy souvenirs to take back home. Overnight at hotel. Our company staff will transfer you to Tribhuvan International Airport approximately 3 hours before your scheduled flight. Note: In case of emergency during the trip, Helicopter will by arranged by Swiss Family Treks & Expedition GmbH.The charges must be paid by the clients themselves. 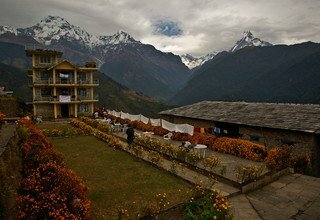 * 5 nights deluxe accommodation in twin bed sharing basis with breakfast at 3* Hotel Marshyangdi in Kathmandu and Temple Tree Resort in Pokhara. * Sightseeing Tour as per above itinerary and all entrance fees. * Domestic flight ticket and airport tax. * All transportation by private vehicle/Tourist Bus. 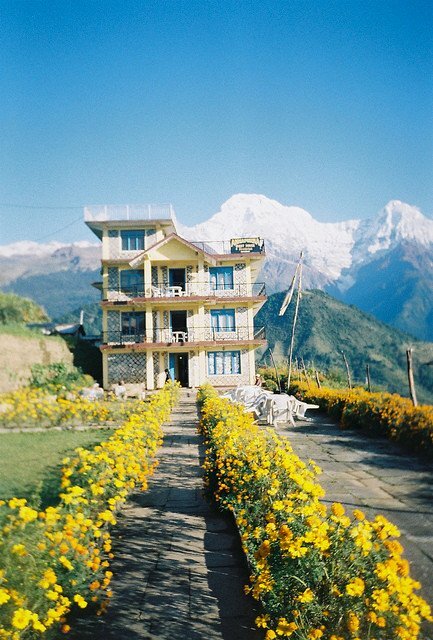 “While we were planning the trip and trek, Swiss Family Treks was of great help. They understood exactly what we were looking for and were not afraid of reworking the trip plan a few times until we got what we wanted. 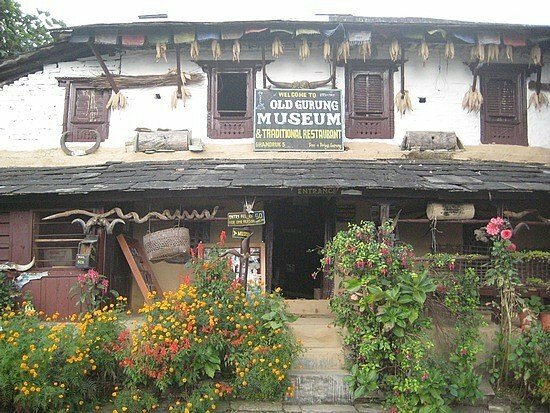 We made a fantastic trip, including a few days in Kathmandu, a challenging enough trekking, a couple of days in Pokhara, so beautiful with its lake, a few days in Chitwan, a great National Park worth visiting." With two young children (6 and 10 years old) the potential for a seven day trek in Nepal to go seriously wrong is fairly high. 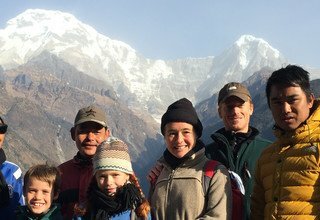 However, with Swiss-Nepal family organising the trek, our holiday in Nepal turned out to be a great outdoor adventure that our family will remember fondly for a long time. 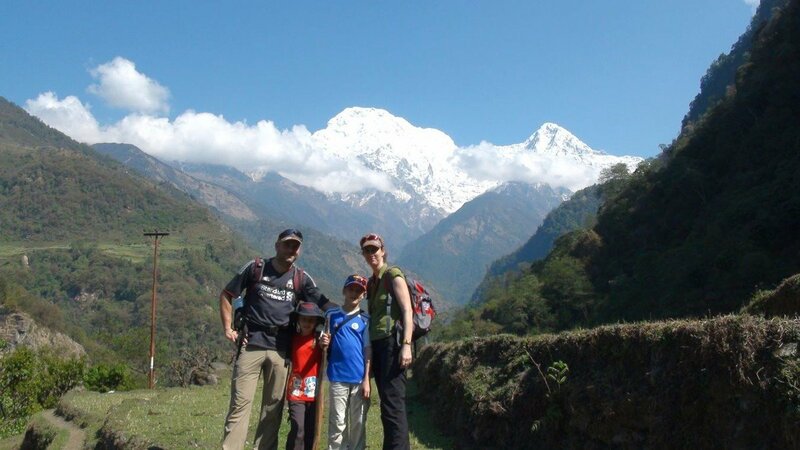 The fact that Stephan, a Swiss national and one of the two owners of Swiss Family Treks, has lived in Nepal for many years and has four children of his own means that guests get a service which is perfect for families with young children. 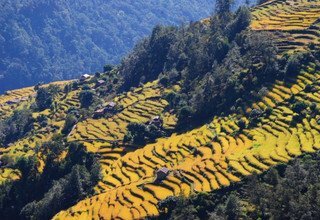 He and his partner's Nepalese national, backgrounds mean that they understand the needs and expectations of Western families travelling in Nepal and are able to offer a fun, safe, and exciting outdoor experience in Nepal. 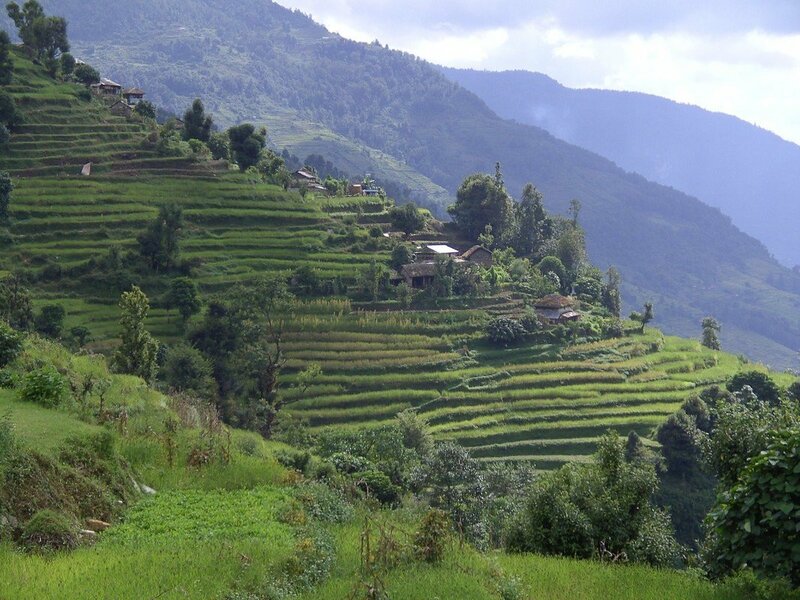 We undertook a six day trek, starting near Pokhara across the Annupurna mountain range (4-7 hours trekking each day) followed by two days of water rafting on the Trishuli river. Stephan and his team allocated a terrific guide (excellent English and a very patient and flexible attitude) along with two porters who were also very capable and strong! My wife and I wanted to carry our own backpacks, and initially thought that a guide plus two porters was overkill. However, when my wife came down with a fever, she had to hand her back pack to one of the porters, and we were grateful that we had the extra person to help carry the load. We thought that the 6 year old might struggle with the trek and would need a bit of carrying herself, but she turned into quite the trooper and walked every inch of the way. With two young children, one of my wife's main concerns was safety; our porter had been trained in basic first aid and was very conscious of safety during the trek. He stayed with us, never walking ahead. My wife quizzed him, and he explained what they would do in the event of an emergency (broken bone, altitude sickness, etc). Moreover, the group that Swiss Family Treks organized to take us rafting was again very safety conscious, and at one point had us leave the raft to walk around a particularly dangerous set of rapids. Another great thing about Swiss Family Treks was the routes they chose were “spot-on” for our abilities, and I got the sense that they knew the mountain passes inside out and could vary the route accordingly. They also picked excellent spots for lunch and for the overnight stays. This is a real advantage; spending time trying to pick a good lunch option or a good overnight place (from all tea houses on offer) is really ‘pot luck’ for most travellers, and one is bound to make some bad choices. With Swiss Family Treks, the places chosen were universally the best on offer as far as we could tell (although I hope the team does review new options that arise, and continue to evaluate existing places). All of this made everything so much smoother and gave us the ability to just relax and not worry about logistics at all during the trek. We could take our ease and mentally relax without having to organise anything (we have enough organising to do at home and in our day-jobs!). One might do this experience somewhat cheaper, but for the extra cost involved, choosing Swiss-Nepal family was more than well worth it. A brilliant team and a great overall experience. The Green bus service to Pokhara is really good by the way, if you don’t like flying on those tiny airplanes. The green-line bus driver was punctual and safe and not taking the crazy risks that everybody else is taking. Better than a car and ten times cheaper. We had a great trek in Nepal thanks to your good team and organization. Lalu was a very good guide, and had done a great job getting us rooms with attached bathroom and hot water in all the lodges! We also really enjoyed the porters' company - especially Ronik - He has a special ability to be with children and Paul just loved walking with him. We would very much like to come back for another trek next year - and we would love to go with these guys again. Our general impression is however that your agency is very well run and that you offer quality services which gave us an experience for life. 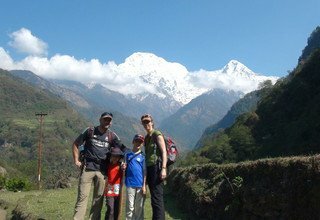 We will come back and do treks in Nepal in the future, and will recommend Swiss Family Treks to everybody we meet who want to do family trekking in Nepal!